Nate Lewis’s approach to artmaking has evolved out of his experiences as a critical care registered nurse. By applying the use of the hundreds of diagnostic lenses, nurses can view the unseen tensions within a multitude of systems for greater clarity. Cloaked Tensions applies ink for the first time based on the idea of contrasting dyes providing a clearer image during a medical examination. In the same way that diagnostic lenses are thorough in their examination of unseen tensions, Lewis thinks the viewer examines work in much the same way to understand unseen tensions that dictate their systems of thinking, understanding, and the presence of empathy (or lack thereof). Particular narratives for black people and black history have always been linked to a conditioned tension and disdain. 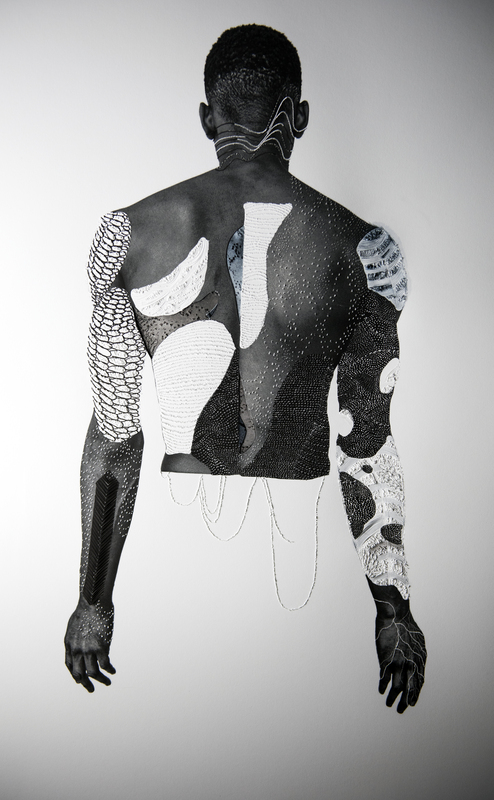 As an act of inquiry, empathy, and care, Lewis speaks to tensions of the past, present and future tensions surrounding black people by exploring themes of erasure, unknown histories, and resiliency on ink and paper. Nate Lewis is a New York City- and Washington, D.C.-based artist originally from Beaver Falls, PA. Working with figurative and portrait styled imagery, Lewis creates sculpted paper photo works that highlight bodies and the unseen tensions of the past, present, and future. These images utilize diagnostic lenses and contrast dyes in order to reveal erased and unknown histories, and toggle the line between presence and absence, as well as distortion and illusion. He aims to challenge our lenses and the powers that hold our attention, with the intention of creating opportunities for questioning and perspective alteration during a time wherein our information feeds are severely controlled by the digital world. Cloaked Tensions is presented in conjunction with 1:54 Contemporary African Art Fair, as a 1:54 Special Project. Lewis was a Pioneer Works artist-in-residence in Fall 2017.